I'm still not panicking here, and neither is the Stock Trader's Almanac's Jeff Hirsch. I wrote over the weekend that while the Dow Jones Industrial Average was tumbling 665 points on Friday, I was so unconcerned that the only action I took was to make a chai latte. Well, I finally changed my strategy on Monday when the Dow fell nearly 1,600 points intraday. I made a decaf coffee, instead. However, I still don't plan to make any changes to my investments unless the Dow falls much, much further -- perhaps to 18,000. That's more than 6,000 points from Monday's close, even after the Dow tumbled a record 1,175.21 points to end the day at 24,345.75. Why buy at Dow 18,000? Simple, that's where the index stood in April 2016, the last time I tried -- and utterly failed -- to predict where stocks were going next. Back then, I held off buying some additional shares of my favorite index fund because I thought the market was overvalued. Rather, I decided to wait until we got maybe a 5% pullback to around 17,100. Nearly two years later, I'm still waiting. The Dow never hit 17,100; in fact, we've never even seen 18,000 again. Instead, the key index has soared by some 35%, even after taking Monday's record pullback into account. That means I've missed out on 35% of gains. The Dow has tanked since its Jan. 26 record high, including a 1,175-point drop Monday. But it's still way above 2016 levels. Now, it's possible that the Dow will fall all the way back to 18,000 from here. But if that happens, all that I'll get for nearly two years of waiting will be a chance to buy stocks at the exact same point where I could have picked them up in 2016. So, don't count on me for either bargain hunting or panic selling here; I won't do either. Neither will Jeff Hirsch of the Stock Trader's Almanac, the ultimate reference book for what markets do over the long term. 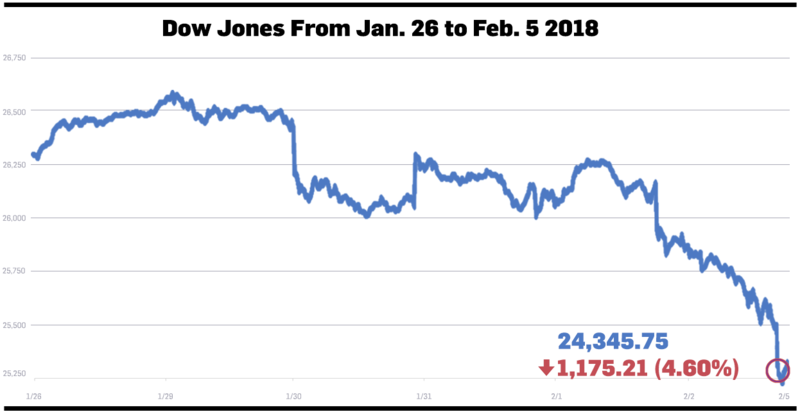 "We're sticking to our strategy -- one big day isn't something to make a big change on," Hirsch, editor of the Stock Trader's Almanac and chief market strategist at Probabilities Fund Management LLC, told TheStreet as the Dow tanked. Hirsch noted that while Monday's massive pullback did represent a one-day record for the Dow in point terms, it was only a 4.7% retrenchment on a percentage basis. That's nowhere near a record in percentage terms. The expert also believes the Dow's current bull phase isn't anywhere near record magnitude in percentage terms, either. After all, the bull market has only added some 70% between what Hirsch considers the runup's start on Feb. 11, 2016, and its peak to date on Jan. 26. That's well below the 85.6% average gain for Dow bull markets since 1900, the expert said. Add it all up and all that Hirsch sees so far is "a little bit of a correction here. I'm just not overly concerned about it at this juncture." TheStreet's Executive Editor Brian Sozzi and reporter Kinsey Grant analyze Monday's market meltdown in real-time.